Based on the price action that can be seen for the price of Bitcoin, it appears as though the price action will continue over the next few days. The price action reflects a steady, yet increased growth trend. 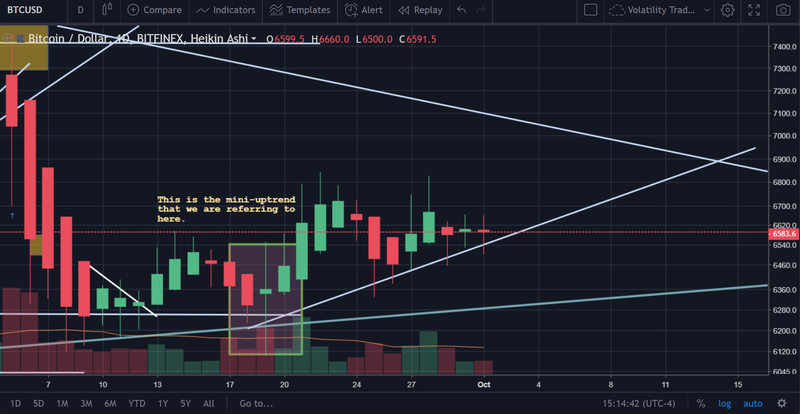 The potential break above the resistance that the price is at currently could lead to a mini-spurt toward the long-term downtrend resistance that has been held in place since March 5th. However, that appears to be the maximum upside for Bitcoin at this point in time. In the long-term, it appears that there is significantly more downside to the price that has yet to be experienced and this could potentially entail new lows that are dramatically below the ones that were experienced before on the protocol. The potential upside price for Bitcoin from the point that it is at currently is fairly minimal, all things considered. In laymen’s terms, this means that the potential increase in price from where it is at the time of writing (approx. $6.6k) represents a minimal buying opportunity and thus should cause traders to call into question whether it is worth it to place any type of investment into the crypto at all. 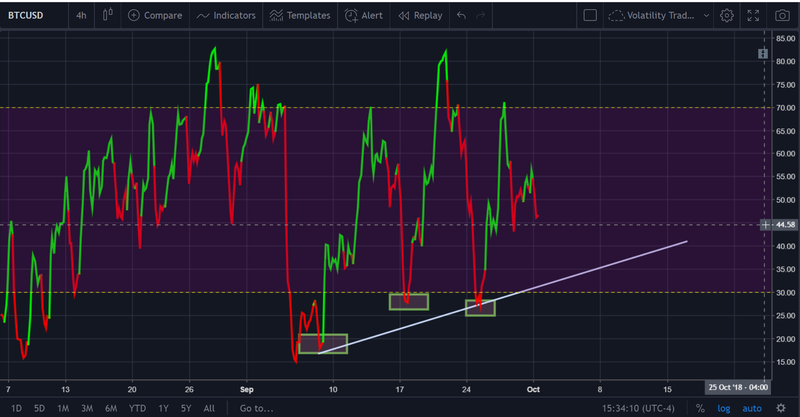 The volume is certainly waning on the daily chart (per TradingView data), which is usually indicative of very weak price action. 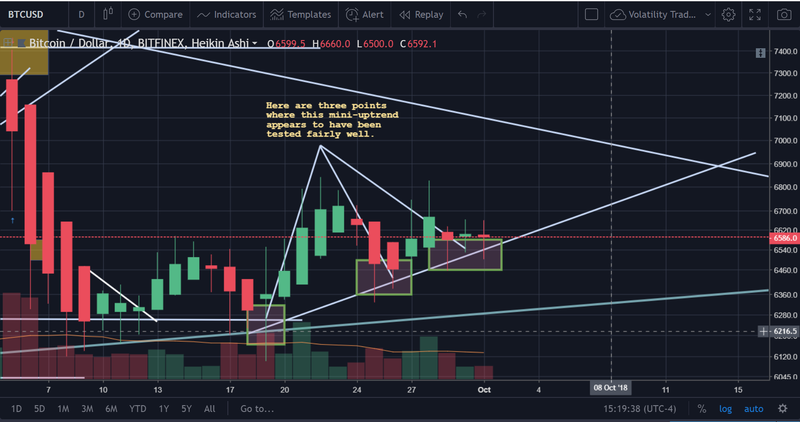 The chart above depicts a ‘scrolled in’ view of the daily candles for Bitcoin at the time of writing. As can be seen in the chart above, there are a number of converging points of support/resistance that have been created on the chart. However, what we’re going to pay attention to here is this mini-uptrend that Bitcoin has ben on since approximately September 19th on the daily chart. 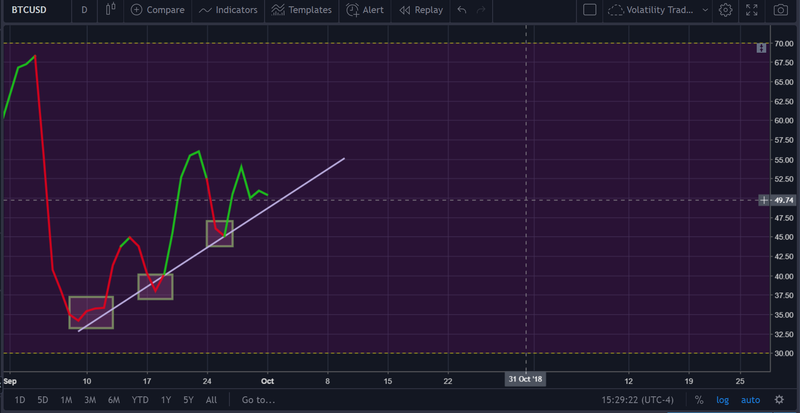 The significance in the picture above is just that the testing of this line at least three times dictates that its ‘legit’ now and that it should hold in the near future. 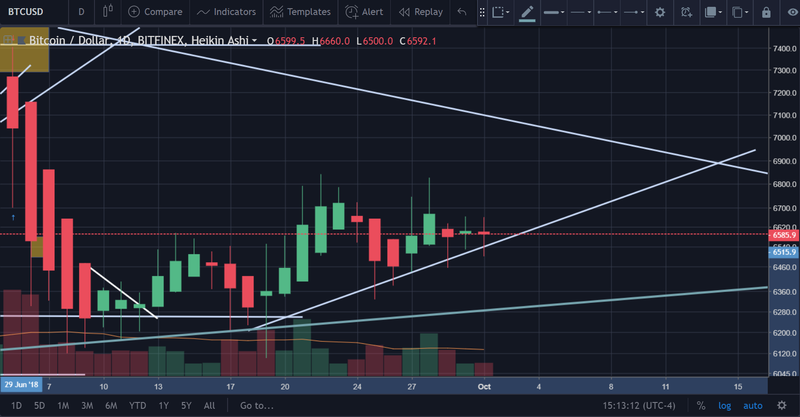 Now, as you can see above the price appears to be on a crash course toward that overhead resistance (diagonal line that you see coming in from the left). 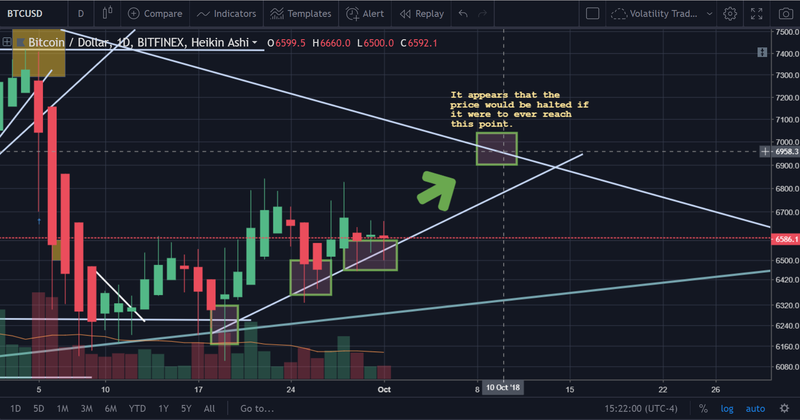 This overhead resistance is super long-term because it was created by the downtrend going all the way back from March to the point that we are at now (at the time of writing; October 1st, 2018). 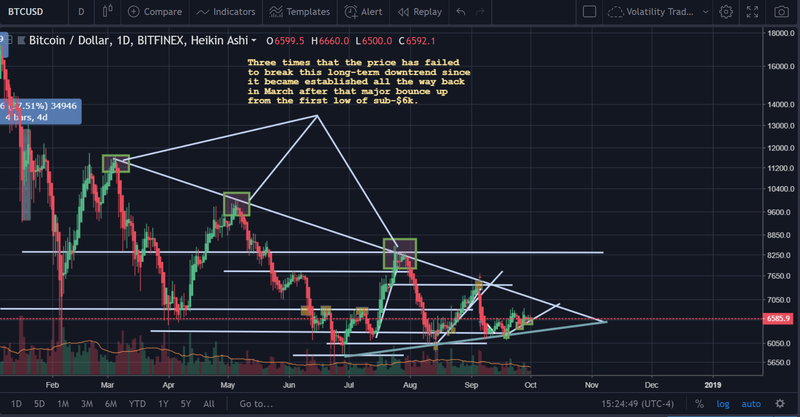 The picture above shows the three times that the price has failed to break this long-term downtrend since it became established all the way back in March after that major bounce up from the first low of sub-$6k. The resistance here is hanging at $6.9k (approximately). Now, that’s enough of the chart, let’s start looking at the indicators (this includes overlays too). In the chart above, we see the RSI(14) on the daily. There are different colors on the RSI(14) here because it is a custom indicator (unreleased at this point). The colors here do not affect the raw reading of the actual indicator, so let’s take a look at that solely here. In the chart above, we can see a clear and marked trending up of the price. 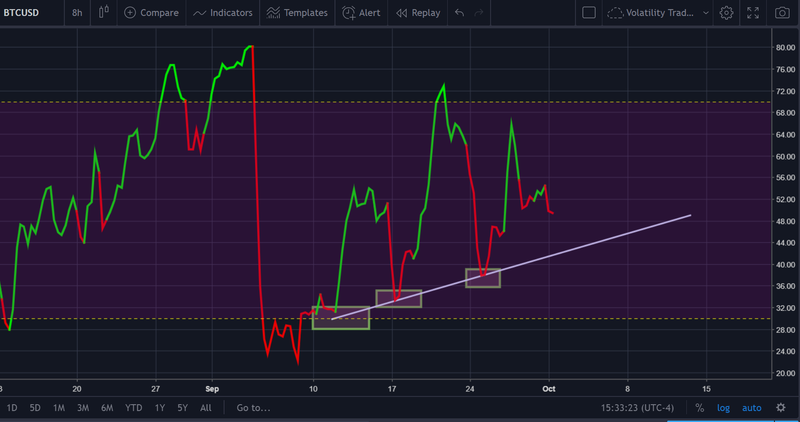 This is positive because if this were not happening, then that would mean that the RSI(14) [on the daily] was reflecting negative divergence instead, which is a bad thing for bulls and a strong warning sign that there could be a potential drop in price coming at some point soon. Beyond that, the RSI(14) is currently at the value of ‘50’, which is well below the overbought point. Thus, unless we are able to see something fairly troubling, then this is positive. However, safety first! 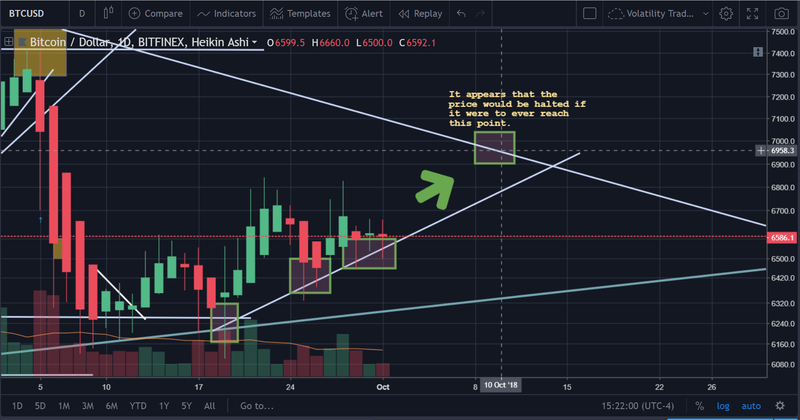 So, let’s investigate some of the lower time frames as well. The MACD, as can be seen above which has been beautifully illustrated by the TradingView staff themselves, reflects a distribution of volume bars that indicate that the MACD is currently converging. This means that the trend is headed slightly upward on the H4. We’re looking at this price chart to see if we can catch any movements in the underlying price trend. So far, there’s nothing definitive whatsoever, and it appears that we are simply waiting for a boost in volume before Bitcoin can either ascend or descend in its price. One thing that should be clear and noted is that the price of Bitcoin is being heavily manipulated. The pseudo-stability of the price serves no purpose than to allow for the inflow/outflow of money being laundered via the currency. C) The most ‘universal’ cryptocurrency in terms of its prevalence, pervasiveness and ease of access. Overall, however, the market forces are only able to manipulate things to a certain extent because there are plenty of free-willed individuals that act autonomously as you would expect in any market. As stated before, if everyone believes that an asset is valued at one price, manipulation can only do so much to change that perception. Whales are also not immune to human psychology either and the practice of currency manipulation is something that is not easy to pull off, nor is it something that every whale has been successful at. Time will tell whether the price of Bitcoin will fall in line with our beliefs. There is little to no remaining upside for the price of Bitcoin (about +5% according to our calculations). So, yes, while there is an expectation that there will be a price increase in the near future and perhaps even a re-test of the $6.8k-$7k zone that it was previously rejected at, it seems doubtful that the price would surpass that point anytime soon. However, nothing is impossible! A short would probably be more reasonable in the long-term based on what we’re seeing at this point in time. Disclaimer: This article is not financial advice, do with it what you will and take responsibility for your own decisions! This is just an idea. We are not palm readers.